Have you ever needed to cut a circle? Turns out you can't just freehand that. 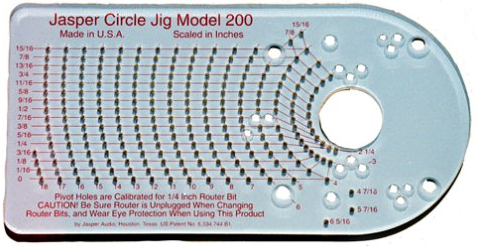 If you want to cut a circle you need a.... Circle Jig! This handy little thing straps onto a standard router. You stick a pin in one of the little holes for the center, strap a router to the other side and route yourself a circle. Here's a commercial circle jig. Seems simple enough. Now what if you want this thing -Right Now-? Well then you better have a Laser Cutter and some Acrylic. Step 1 of the design comes from measuring out the dimensions of the existing router plate. What are those curved holes for? Who knows? But they look cool right? Starting from a base circle of diameter 1/4 in (size of the router bit) we offset another circle at some whole number of mm to mark the smallest radius we can cut. Then we offset a whole bunch of other circles in 2mm increments. Then add some horizontal lines. We want to place the center holes at intersections of the horizontal lines and circles. It took forever. And ever. That's a lot of holes. As the cold weather season arrives in Atlanta, with it comes issues with our 3D printers. Specifically problems with temperatures and print stability. Freeside is essentially a big warehouse, and our 3D printing station is setup in the large open area in the front of the space. What this means is that when it is cold in the space, this will affect the printing quality because the ambient temperature is far lower than what is optimal for thermoplastics. 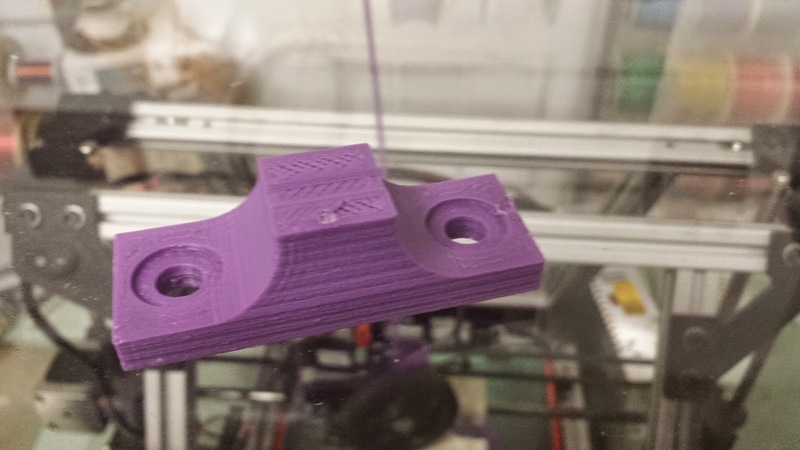 The cold ambient air will cause parts to rapidly cool during the middle of a print. 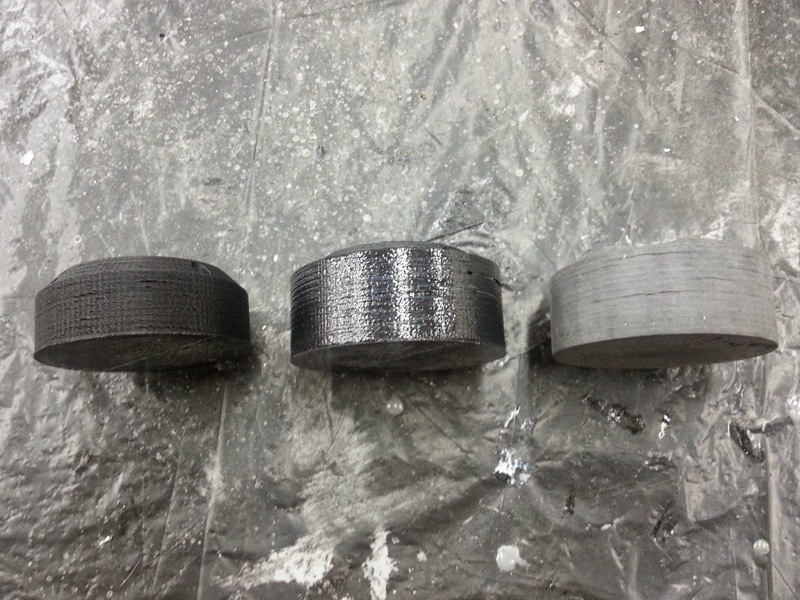 And with materials like ABS which can shrink dramatically during cooling, this causes prints to warp, deform, and delaminate during and after printing is finished. The print on the left is showing signs of delamination from plastic cooling mid print. 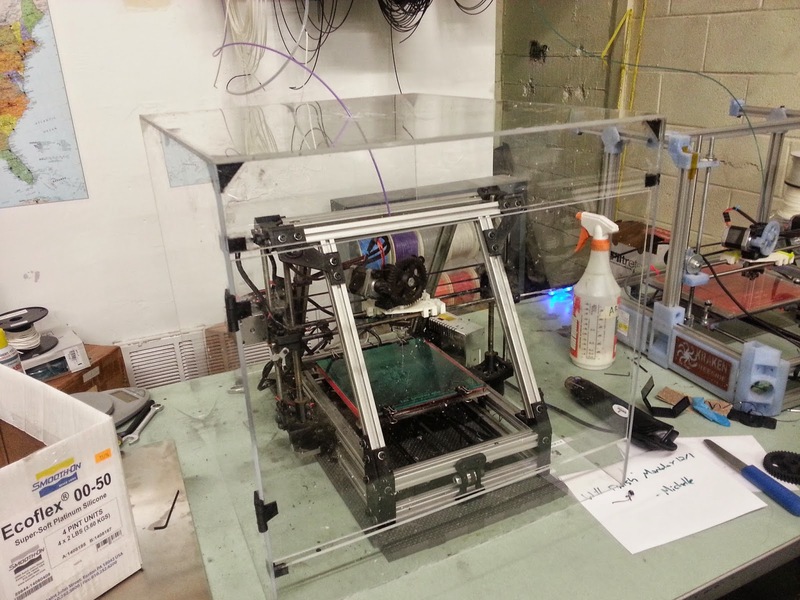 To remedy this, we built an acrylic enclosure for our LulzBot AO-100, which is our dedicated ABS printer. 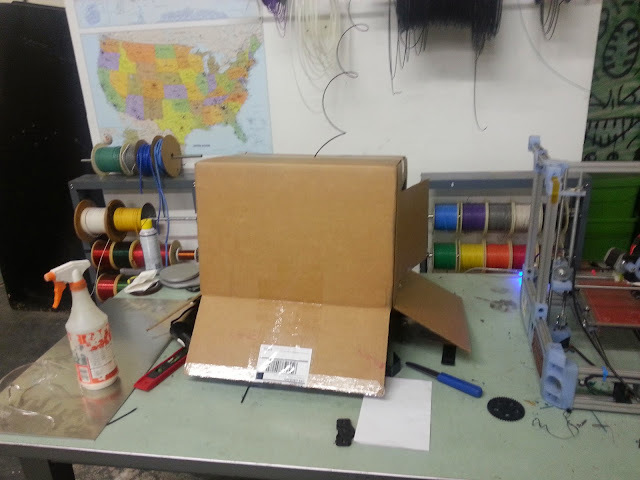 We tested the proof of concept of whether an enclosure would help mitigate printing problems by sticking a big cardboard box on the LulzBot to trap heat in. We also tried pushing hot air into it using a heatshrink heat gun, which turned out to actually cause the temperatures to be too high and 3D prints suffer problems on the other end of the spectrum. The LulzBot sitting inside the shame box. 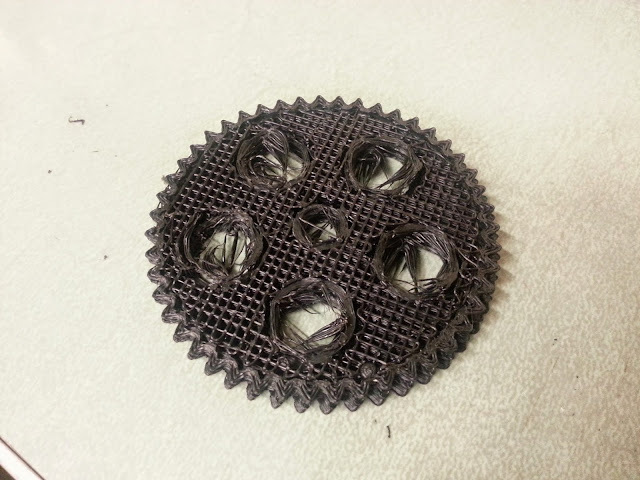 Print affected by ambient temperature being too high. Removing the heat source made the printer spit out great quality prints, and we then moved on to building the acrylic enclosure. There is a lot of scrap materials at Freeside, including several large sheets of 1/8" and 1/4" clear acrylic. Using the outer dimensions of the LulzBot (and adding a couple inches for safety), we drew up a quick design, and cut the acrylic on the table saw. 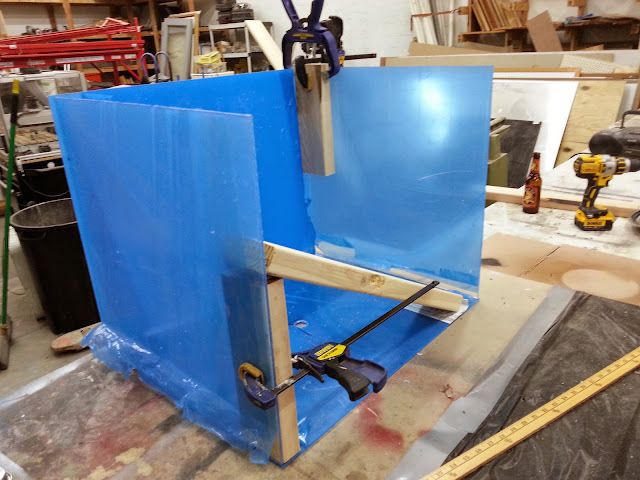 The acrylic panels were aligned and clamped together using scrap pieces of wood, and the acrylic was bonded using acrylic glue. We also 3D printed hinge and corner pieces that we found on Thingiverse to help add support. Two holes were drilled into the box, one in the top for the filament to feed through, and one in the back for the power and USB cables to enter into the box. The door was affixed using 3D printed hinges, model grade cyanoacrylate which melts and bonds ABS and acrylic, and a short piece of 3mm filament used for the actual hinge. The LulzBot looking like a piece in an art exhibit. All together the build took less than 2 days from start to finish. We need to dial in our printer settings - we had raised the extruder temperature profiles to compensate for the cold ambient air - but things are already printing much more reliably. We were uncertain if we needed some sort of heating element, but it seems that the heat put out by the extruder and the heated bed are enough to keep the inside of the enclosure warm enough for quality printing. The next order of business will be adding a temperature sensor and an exhaust fan for when things get too warm, but that will be a project for another day!